Taipei to Hong Kong is the 8th most flown air route in the world, carrying over 6 million passengers annually. Cathay Pacific owns an all wide body fleet, yet operates Hong Kong to Taipei essentially as a shuttle service. When I booked my ticket, I aimed to try out their regional business class product since they had just recently updated it. Unfortunately, or perhaps fortunately, there was a last minute equipment change, and as a result I got to fly on an internationally-configured A340. I have always liked the A340, mostly because its four-engine configuration makes the cabin relatively quiet. While Cathay has one of the most renowned long-haul Business Class products, they still use the old seats onboard their A340s. These old seats are the original lie-flat that Cathay introduced where the windows seats angle towards the aisle. They were very cool when they were first announced, but many people have since described the seats to be “coffin-like.” Of course, I don’t really think it makes a difference for a 1.5-hour flight. We have previously reviewed the same product, on a flight from Hong Kong to Bangkok. Check out this refreshed take below. Both doors were opened for boarding and I boarded through door 1L (for First/Business class). There were a lot of people congregating at the gate so by the time I boarded, Business Class was already more than half-full. The cabin was laid out nicely in a 1-1-1 configuration, while artwork served as a sort of cabin decoration up front. I settled quickly into my seat, 20A, which was a window (and aisle!) seat. Here is a picture of the seat adjacent to mine, for a better idea of how the footrest looks. I explored the seat controls and they were easy-to-use and modern, just how I remembered. I also liked the fact that one of the two provided pillows came attached to the headrest, which made lounging very comfortable. Shortly after everyone boarded, a flight attendant came by with a tray to offer everyone a pre-departure beverage. There were three choices and instead of the orange juice or water, I selected a glass of champagne. The beverage service was accompanied by a hot towel. Another flight attendant came by to offer blankets. They were not individually wrapped, but instead pulled from a huge plastic bag. A third flight attendant swung by to present the menu. He addressed every customer by name (i.e. “Mr./Ms. XYZ, here is our menu for dinner”) by reading off a list. After he said my name that firs time, he used it throughout the flight, even for the tiny things! Cathay service at its finest. Yup. There was a printed menu for a 1.5-hour flight. Meanwhile, US airlines don’t even offer meals for a flight this short. On a flight that was only an hour and 20 minutes from wheels up to wheels down, the flight attendants worked very efficiently during meal services. Here is the menu for dinner. The starter was very delicious. The pineapple accompanied the rich and savory flavors of the duck liver perfectly. Bread was also served. For the main course, I went with the Chinese selection. The fried rice was little crunchy due to reheating, but the chicken was perfect. I was pretty full since I already had noodles at the lounge, so I only sampled the dessert. I am not a big fan of banana, but it was still pretty tasty—creamy without being heavy. Anyway, here’s the full dinner tray. I made a point to put the bed down for the sake of blogging about it, so I feel bad that the photo was lost. Trust me that the shoulder space was ample and the bed was comfortable—comfortable enough I wouldn’t mind spending 10 hours in it. The cabin was lit up in a pale purple for the majority of the flight. Right as flight attendants collected the meal trays, etc., we began our initial descent. Short haul flights like this really showcase the quality of the crew. The flight attendants were attentive, professional, and catered to every need of the passengers. This flight reminded me how and why I love Cathay, and left me impressed like every flight I have had with them. 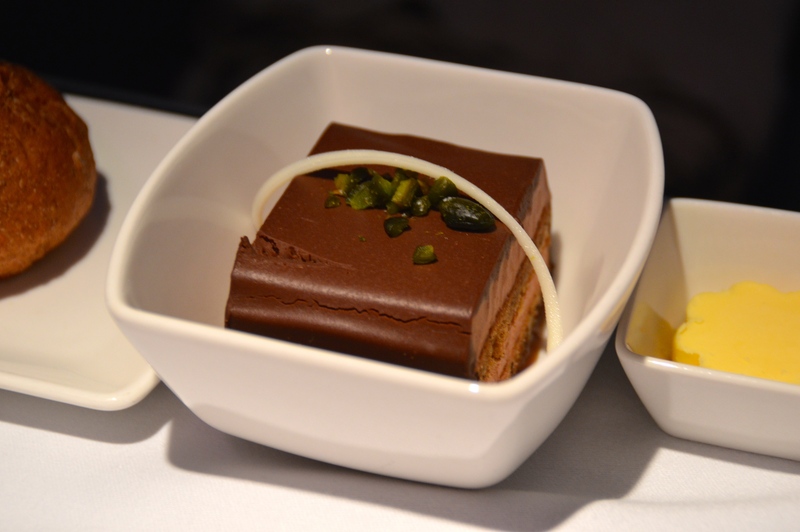 Cathay to Offer Business Meals in Economy? How Much Would You Pay for A Business Class Meal in Coach?